It will take the world’s poorest countries more than one century just to reach the level of climate change readiness that the richest countries already enjoy, according to data released Thursday (Dec. 12) by the 2013 University of Notre Dame Global Adaptation Index (ND-GAIN). The latest version of Notre Dame’s annual index highlights huge disparities between the developed world and developing world when it comes to being prepared for the problems climate change is expected to cause in this century. This year’s data show that the ND-GAIN Index is more than just a ranking of countries. The index, which is “open source” and available to anyone with an Internet connection, contains crucial information for policymakers, the private sector and nonprofits. The index aims to unlock global adaptation solutions that save lives and improve livelihoods while strengthening market positions in the private sector and policy decisions in the public sector. It informs strategic, operational and reputational decisions regarding supply chains, capital projects and community engagements. “This year’s announcement shows that the index contains data that can clearly help decision-makers determine global, regional and national priorities,” Chawla said. Under the United Nations-led climate talks, billions of dollars have been pledged to help the world adapt to climate change. But key questions remain on where and how that money should be spent. ND-GAIN is one tool that can help governments, nongovernmental organizations and the private sector better target those and other investments. 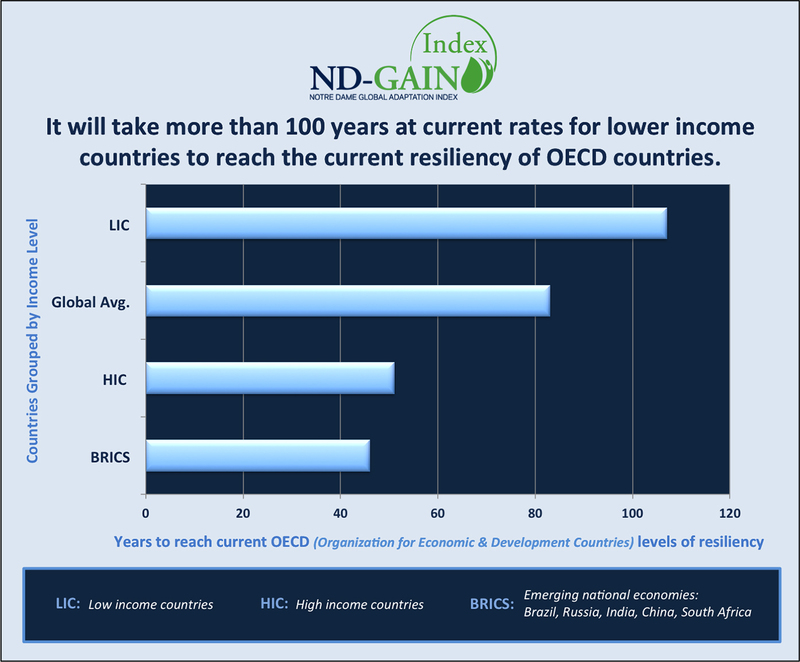 The 2013 Index was released on Thursday (Dec. 12) at the ND-GAIN Annual Meeting hosted by the Wilson Center, a nonpartisan global public policy institution. The ND-GAIN Annual Meeting serves as the premier gathering of domestic and international experts on climate change adaptation and is attended by leading figures from the government, nonprofit and private sectors. Originally published by Julie Hail Flory at news.nd.edu on December 12, 2013.